I returned from Bulgaria with mixed emotions. Most of the churches we have input into are doing really well yet still face huge challenges as the economic situation is hitting the people hard and those who don’t have much to start with end up with even less. Pastors are losing the small salaries they survive on due to reduced giving brought about by the recession. An income of 400 leva (approx £168) was an average monthly wage before the downturn when things changed. One lady related to me how she works from 6am until 8pm in a chicken processing factory for five days a week for about £39. That works out at £0.55 an hour and although the cost of living is slightly lower than the UK you can appreciate that her renumeration makes for an extremely low income. 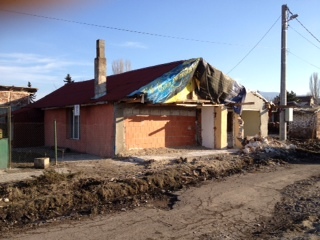 In addition the church in Sofia has lost around four metres off the end of their building. Having some years ago been granted a license to build by the then mayor, they find that the permission actually counts for very little legally so part of their building has been demolished to make way for a new sewer pipe and overhead electric cables. The pastor George, a man of faith, said to me “Praise God that it wasn’t the whole building! At least we still have a place to meet”. Many people in the area lost most if not the whole of their houses. Yet with all of these sort of things going on the people are still seeking God – what an amazing example they are to all of us. During this trip I spent time with two Bulgarian churches as well as six Gypsy churches all of which are hungry to move on with God. One Bulgarian pastor I met recently has a real heart to reach out into his community and asked me to come and teach and encourage his people in evangelism. We did this over two days and had a great time with lots of good feedback. Doors are opening for us in many new areas of Bulgaria so please pray for us that we might have wisdom as to how to respond. On an earlier trip I was asked to speak on Bulgarian Christian TV and recorded a short program and they have invited me to host a mission with them when their new studio complex opens, hopefully later this year. 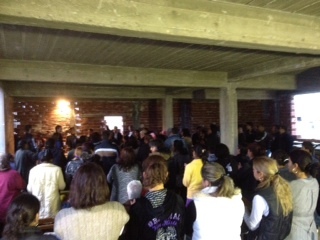 We had the pleasure to be a part of the first meeting in Sasco’s new church building. As they have already outgrown their present building they have moved into the new one even though it’s not finished. 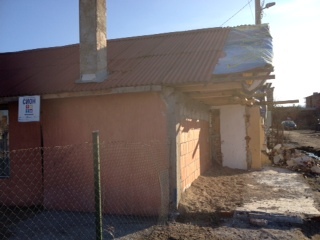 There are no windows, doors or even a roof but it was decided to start to meet in the ground floor with the concrete ceiling forming the roof and polythene covering the window openings. There was a real sense of expectation as we worshipped God together and I feel sure that Father has great things for this pastor and his church. 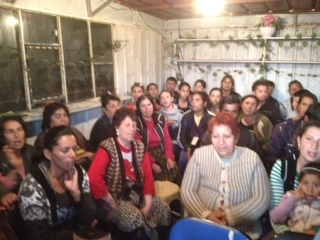 Similarly the church in Malo Kanare are doing well and have outgrown the shipping container that they used to meet in. This giant metal box was filled to capacity with the people packed in like sardines and an overflow of about twenty standing outside. This is fine at this time of year when the weather is starting to get warmer but during the winter when temperatures can drop to -25c it makes things very difficult. The church has a plan and have brought the land on which to build a meeting hall and are at the moment seeking planning permission. Each step involves a tremendous sacrifice by the people to enable them to move on towards their goal. These things might sound simple to us but they show that God has already done so much in this group of believers. Most Gypsy churches would build without any planning permission on any unused land they could find. So for these guys to have saved the money to buy their own land and then seek to build legally with all the cost that it entails is amazing. Most of the congregation are living at subsistence level with each week’s earnings just enough to cover that weeks living expenses. Please pray that they are able to complete the structure before the winter sets in. This is just a small snapshot on the numerous good things that are happening with both the Bulgarian and Gypsy churches we are working with. Please continue to pray for them in these very difficult times.